Japan was uneasy on Thursday morning as the tsunami created by the Chilean earthquake caused ocean tide levels to surge as much as a foot along the eastern coast. The news coverage isn’t propelled by the need to fill 24 hours of “news” as it is in the US. 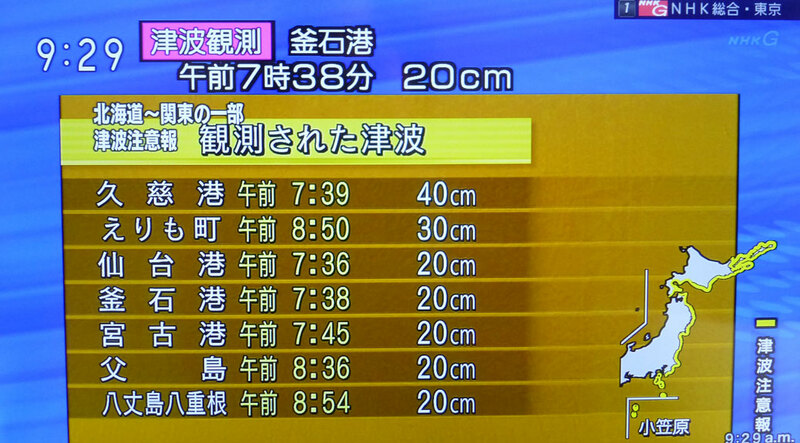 NHK’s dedicated news channel updated the tide tables every 10 minutes or so, but the other channels continued with regular programming. A map of the areas affected by the alert overlaid the screen on every channel. Since we’re located inland, there’s not a palpable sense of panic or concern in Kawagoe.